I recently purchased the Gigabyte Aero 15X v8. I have been using a Macbook for the past five years when traveling, but as a gamer, a MacBook will let you down if you try to run any of the latest video games. I started looking at Windows laptops for the first time in my life, and I fell for the Aero. With an impressive CPU (although hot, literally) and a 1070 Max Q design graphic card from Nvidia, it’s hard not to be curious about the performance. On top of that, it comes with a whopping 94Wh battery and a 1080p screen with a 144Hz refresh rate. In my battery test I have been able to get about six hours of regular internet usage from it. When it comes to gaming, it can last 1-2 hours depending on the game and the processing power required. Not bad for a gaming laptop. If you’ve already solved every issue and your only problem is high CPU and GPU temperatures, go to the bottom of the article. So what’s the problem with the Aero 15X? I’ll start by saying that the Aero 15X problems are fixable because it’s about software and not hardware, at least in my case, and if you buy this laptop you can fix the issues too. It did take a few hours of work, and it wasn’t like when I bought my MacBook which worked great right out of the box. Some basic knowledge about computers is recommended before you attempt the steps below, but if you’re buying this kind of laptop, it’s probably not your first one. I will also try to help you as good as I can, and if you run into any issues you can send me an email through the contact form or leave a comment down below. So the problem is the way this laptop is set up when it comes out of the box. When I started it up, it acted like a new windows installation and it let me set it up with my Microsoft account and settings. But there are bloatware and old nasty drivers that could make one believe that the hardware has issues. A touchpad that froze every other minute and a slow restart to name a few. An unpleasant experience to say the least, for a computer that just cost me over two grand. I thought that it was just old drivers causing issues so I did what everyone else would’ve, I updated the drivers. Unfortunately, it didn’t fix all the problems. I will let you know what I have done to my computer to get it running the way it should’ve from day one. Reinstall Windows completely, don’t just do it through Windows 10. There’s a feature in Windows 10 that lets you remove all the files and programs. It’s accessible through the “Update & Security” in Windows Settings. I thought this would create a clean install of Windows 10, but it didn’t. I still had issues and I still don’t understand why because it’s supposed to do a clean install this way. I had to do a real clean install. If you have access to a .iso file of Windows, you can use a program called Rufus USB. If you don’t, Windows can help you as long as you have a valid Windows 10 license. I used Rufus USB to create a bootable USB drive, you must set the partition scheme to GPT. I tried MBR but the USB drive wouldn’t show up as a bootable drive on the Aero 15x. Part of doing a clean install is deleting everything on your hard drive and installing a fresh copy of Windows on it. This way, no bloatware (except Windows new crap) will be installed on your computer. If you’re doing a clean install through the Windows app linked above, Windows will help you go through the steps of doing a clean install. If you want to use Rufus, Groovypost has a quick tutorial on how to set it up (remember GPT instead of MBR) if you have the Aero 15x. Then all you have to do is boot holding F8 on your keyboard with the USB drive plugged in and choose the USB drive. Then you will have the option to go in and delete your hard drive completely and then you can install Windows on it. This is the only way that ended up solving all the issues for me. Gigabyte has a bunch of programs that let you manage everything. Fans, RGB, temperatures, updates, charging settings and even built-in brightness and volume controls. All of these drivers and programs can be found here for the Aero 15X v8 version. Smart Update – I don’t use this but it’s good to see what Gigabyte thinks are the latest drivers for your hardware, I will tell you a better way to keep them updated below. Keyboard Firmware under Utility (IMPORTANT!!) The keyboard on Aero 15x have had issues where on occasion letters double type even though you only pushed the letter once. Since downloading this driver, I haven’t had any problems with that. The reason I don’t recommend downloading the rest of the drivers here is that Intel has a better way of keeping the rest up to date. They call it the Intel Driver & Support Assistant and can be found here. What this does it that it scans your computer for your hardware and then tells you what drivers need to be updated. I can download drivers here that haven’t been recognized by Gigabyte, so they haven’t been added to Smart Update or their Downloads page. By running this program in the background I can easily see when there’s an update. I recommend using this to update your drivers. I ran into an issue where the GTX 1070 would not run on battery power. I solved it by installing Nvidia Graphics Driver 399.24. Now I can game on battery power with high fps. Remember that when you install the 399.24 driver, do an “advanced” install and make sure the “Clean install” box is ticked before you proceed. The Aero 15x comes with ELAN drivers that repeatedly have been critiqued and rightfully so, they’re not very innovative, and they’re missing basic gestures. Coming from a MacBook it’s especially frustrating to use these drivers, and it makes you realize how Apple has nailed trackpads. What I recommend doing to fix this is to update to Windows 10 precision drivers, it’s easy to do if you follow a video Dave Lee made on this topic. So three easy steps, from a disappointment to a very powerful laptop. It takes a bit of time to get each step done, but I promise it’s worth it. Again, if you have any questions about any of the steps, let me know either through a comment or an email. We all know that if you’re going to be playing games on this laptop it’s going to run hot, there’s no way around it right? Well, actually I have solved this issue too. Let me walk you through what I’ve done to make the temperatures less scary. First, I’d like to tell you what GPU and CPU temperatures I saw before I did anything about it. I started playing Rocket League and after 10 minutes my CPU would be at 90°C. My GPU would be at almost 80°C. I know this because I was monitoring the CPU temperature through a program called Core Temp, and the GPU temperature through TechPowerUp GPU-Z, both are free to download. The CPU being at 90°C is fine, but not sustainable because it might shorten the life of it. The same with the GPU. The first thing I did was download a program called Intel Extreme Tuning Utility. What this will let you do is undervolt the CPU which will limit the power it can use which leads to cooler temperatures. The great thing about doing this on this laptop is that it doesn’t lower your performance, but the opposite. When the CPU runs cooler, it won’t throttle and you won’t see dips in performance because of heat. I am not an expert on CPUs, so please know that you’ll do this on your own risk. All I do in Intel’s UTX is change the “Core Voltage Offset”. Mine is set to -0.150 V. The CPU in your laptop might be able to take a higher or lower value, so you’ll have to try to set it and then stress test it a bit to make sure you don’t get a blue screen. In case you do, Intel’s UTX will automatically reset your voltage not to damage anything. This on its own reduced my CPU temperature by almost 10°C which is incredible since it doesn’t lower the performance. The second thing I did is more of a general smart thing to do when you have a laptop, buying a cooling pad. I found a video on YouTube that goes through a bunch of different ones from Amazon. 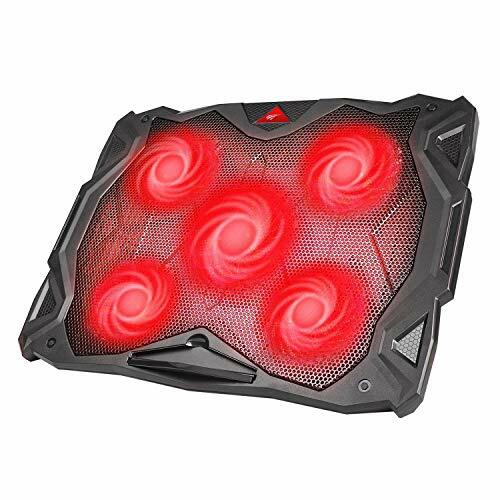 But I can save you 13 minutes of your life by telling you that the HAVIT 5 Fans Laptop Cooling Pad gets the most praise and it’s the one I bought. So far it has been great and exceeded my expectations. It brought down the temperature of the CPU under load by an additional 10-15°C. So by undervolting the CPU and adding a cooling pad, my CPU is running around 15-20°C cooler. No more throttling and hopefully a CPU that will last longer. I haven’t seen the GPU go over 70°C so I am not worried about that one. The Gigabyte Aero 15X v8 has been the machine I hoped it would be when I bought it and I hope that it will last me years to come. If any other issues show up, I will create another post about it. If there is anything that is unclear, don’t be afraid to send me an email or leave a comment. I just wanted to thank you for creating this article. I followed your steps to a T and my laptop is leagues beyond better than it was. Earlier today I was at 2 hrs for battery life. After reinstalling windows and drivers like you instructed my battery life jumped to 10 hrs. Thank you! Glad I could help, Jon. Thanks for leaving a comment! Hey mate nice write up. On the forums there are a lot of posts where people do fresh installs and run into BSODs and driver mismatch.. Did you have any issues later on after you did this write up? I’ve seen that too and was worried about it but I haven’t had a single bsod or driver mismatch since I reinstalled everything, about five months ago now. I don’t know if I’m just lucky but I bet installing most drivers through Intel’s program has helped make it stable. I also make sure to do a clean install of every new Nvidia driver. The only issue I have now is some mouse stutter a minute or two after waking from sleep, but it goes away in a couple of seconds, not sure why, but could be related to optimus. Hey man, thanks doe the guide. I have two last question. You are mentioning completely whipping the drive. I imagine that there is a recovery partition. Shall I delete the too. Like delete every partition so that there is only one and let Windows repartition? Second one: can I reinstall windows directly without first going through the stock windows setup? I am asking this in regard of that I don’t know if windows still needs to register the hardware. I deleted every single partition, even the recovery partition. When I reinstalled Windows, it created a new one for my new installation. Since I am not 100 percent sure how the digital license works, I would recommend going through the initial Windows setup before deleting the partition. Also make sure you install the same Windows edition it came with for the digital license to activate. and what do you think about repasting? I have some leftover Kryonaut at home. I haven’t repasted yet but I have considered it. It would definitely help if you’re having issues with CPU temperatures. For now I just keep the CPU undervolted and put the fan underneath when I am gaming.